I apologise for the inactivity on my blog of late, but reviews have been ongoing, however, some of you may know I now review for Rukia Publishing. I will still be posting reviews here and I have a backlog to post so please bear with me as the posts from my blog increase over the next couple of days as I catch up. My reviews for Rukia are being loaded this week and will be called Book Nerd reviews. Rukia's latest review is available now! 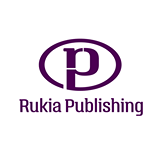 If you would like a review contact me or complete the contact form on the Rukia Publishing website. Wow, I love these books and I could not resist reading this in one sitting. A great concept and I massively enjoyed the plot twists. You had me fooled a couple of times into thinking I knew what was coming then you hit me with another twist. I liked the way you managed to add a hint of humour into serious scenes, and how well you brought to life the characters and the places. I am now officially a fan and I can’t wait for the next instalment. I really enjoyed this book. It has a great plot and some well developed characters. I wasn't expecting it to be funny, but the places where is was were well places and did not detract from the seriousness of the phone hacking and murder storyline. The character of Kendall is very well written, all of his idiosyncrasies are believable. His side kick Mollie speaks and acts like a real woman keeping him in his place, yet respecting his experience as she pushes him into being a great PI. A great read. Time is money, and although I love to read, the time it takes to post the reviews is of value to me. Therefore, if you would like to make a donation for my time it would be appreciated. Books are given to me for promotional purposes, I will never resell your books. If I can't give a review/rating of 3 star or more I will email you the reasons. If you appreciate the time it takes to read a book, write a review and post it to Amazon, feel free to make a donation. I work fulltime in a factory so any funding towards my book habit is most welcome. Thank you.